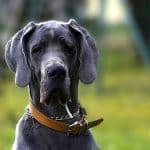 To ensure your dog lives a long, healthy life, you need to make sure that his body weight stays within the proper range. 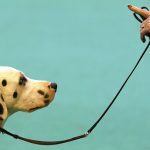 This is especially true for large breed dogs, who are extremely susceptible to weight gain. This will often require you to look for a low fat food to reduce his caloric intake. We’ll try to help you do this below, by reviewing five great low fat dog foods for large breed dogs. Just be sure to compare the options presented carefully, so you can select the best product for your pet. You don’t want to run out and buy the first low fat dog food you see. Rather, you’ll want to make sure you select a high-quality food that meets your dog’s specific needs. It is always important to consider your dog’s age, breed, growth rate and feeding schedule when trying to select a low fat food. It’s also important to consider any health problems or special needs that he may have when making your selection. In fact, you should always consult your veterinarian when trying to help your dog lose weight, or anytime you make a substantive change to his food or feeding schedule. High-quality dog foods should feature a whole protein at the beginning of the ingredient list. High-quality dog foods do not contain artificial colors, flavors or preservatives. High-quality dog foods are usually made in the USA, Canada, Australia, New Zealand or Western Europe. High-quality dog foods are usually rich in Omega-3 fatty acids. High-quality dog foods are usually full of antioxidant-rich ingredients, including brightly colored fruits and vegetables. Annamaet Grain-Free Dog Food is a holistic, US-made dog food that features chicken, duck and herring. It is specifically designed to help your dog lose weight in a healthy, controlled manner. 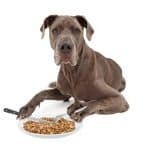 Blue Wilderness Rocky Mountain Recipe is a nutritious and delicious dog food that seeks to provide your dog with an evolutionarily appropriate diet. Made with a number of nutritious meats, fruits and vegetables, this grain-free food is a great choice for many large-breed dogs. Solid Gold Dog Foods is a holistic diet, specifically designed for large- and medium-sized dogs. Made with responsibly sourced bison meat, this food is sure to provide your dog with all of the protein he needs, while reducing the amount of fat in his diet. This Solid Gold recipe is also made with holistic and nutritious ingredients, but it is designed to help your dog lose even more weight than the previously reviewed recipe. This recipe features Alaskan Pollock, which is a great lean protein for dogs. Wellness Complete Health is a high-quality dog food that is packed with a number of different nutritious ingredients your dog will love. Made with deboned chicken and brown rice, this recipe should help your dog lose weight without suffering from reduced energy. 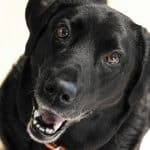 If you ever feel like the dried food or wet food varieties aren’t giving your loving pup enough nutrition or even the right nutrition, you can make your own pet food instead. This allows more control over what your pet is really getting in their food nutrition wise, and permits you more liberty in excluding anything that is causing health issues for your pet. 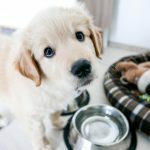 If you ever feel like the dried food or wet food varieties aren’t giving your loving pup enough nutrition or even the right nutrition, there is always the raw food diets and making your own pet food; this allows more control over what your pet is really getting in their food nutrition wise, and permits you more liberty in excluding anything that is causing health issues for your pet. There are many recipe guides and books to steer you in the right direction of making your own homemade dog food. These guides include The Healthy Homemade Dog Food Cookbook, Feed Your Best Friend Better: Easy, Nutritious Meals and Treats for Dogs, or Dr. Pitcairn’s Complete Guide to Natural Health for Dogs & Cats. 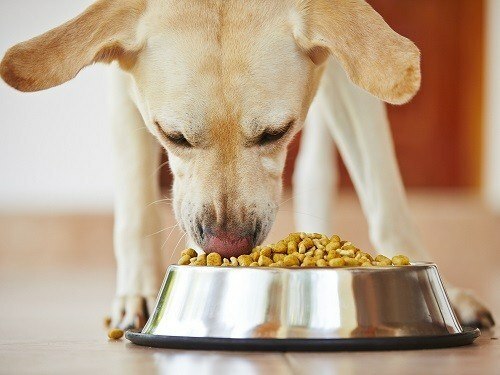 Although good dog foods are often more expensive than low-quality foods, they are safer and more nutritious than economy-priced foods, and they’ll usually taste better too. However, it is hard to put a dollar value on your pet’s health and well-being. All five of the foods listed above are high-quality products, which should serve your dog well. If your dog needs to lose weight, any of the five listed above are good options. Nevertheless, we’d consider Blue Buffalo Wilderness Rocky Mountain Recipe Dry Adult Dog Food the best option of the five.